With much of its coastline covered in jagged black lava rock, Kona is not well known for its beaches. 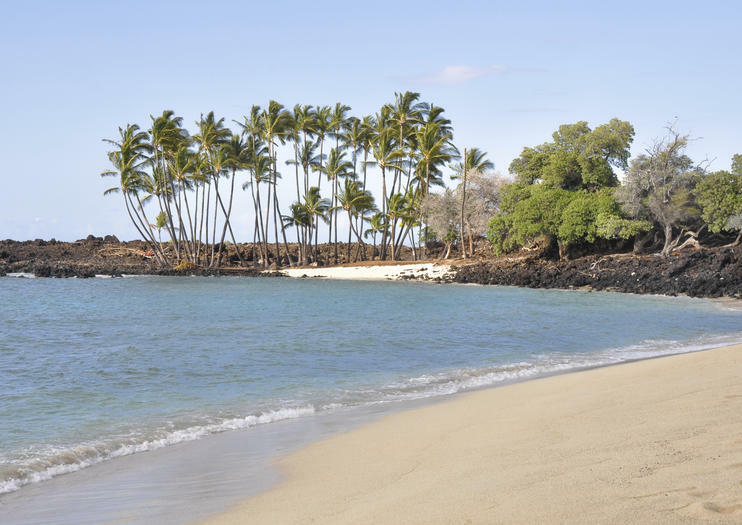 However, a few locales offer the unspoiled white sand oases that typify Hawaii, including the palm-lined stretches at Kekaha Kai (Kona Coast) State Park. The best beachy parts are located more than a mile down a bumpy road through the remnants of a jumbled lava flow. Signs calling stretches “unimproved” are an understatement. Hualalai Volcano, looming behind the park, oozed these paths to the sea between the late 1700s and 1801. To truly appreciate the ocean dip awaiting you (and to satisfy many rental car agreements), hike the 1.6 miles in instead. When you arrive seaside, the small facilities—including limited parking, toilets, showers and an on-the-beach picnic area will be straight in front of you. But, to get to the larger stretches of white sand, you’ll need to continue on, turning right at the signs before the toilet blocks to reach Mahai’ula Bay. Here, it’s not uncommon to spot sea turtles, and the bay’s offshore rolling waves make this a fun spot for bodyboarding, surfing and stand-up paddle boarding. For an even more secluded spot, follow the trail behind the old buildings at the north end of Mahaiula to the double-arched Makalawena Beach. Kekaha Kai State Park’s 12-acre grounds also feature access to a 4.5-mile coastal jaunt to Kua Bay along the Ala Kahakai National Historic Trail, including the Puu Kuili cindercone with sweeping shoreline views. Kekaha Kai State Park (Kona Coast State Park) is located off Highway 19 north of the Kona Airport between mile markers 90 and 91. Visitors with smaller vehicles should park where the pavement ends shortly after the turn off and hike in— be sure you have adequate water and sun protection. 4WD vehicles can attempt the road and park closer to the beach. The park is free and open to the public between 8 a.m. and 7 p.m. daily. Note that the nearest equipment rentals (snorkel, surf gear) are shops in Kailua-Kona. There’s simply no feeling that compares to seeing enormous manta rays up close, as their graceful wings seem to fly underwater and turn in rolls all around you. On this Big Island kayaking and snorkeling tour, experience the thrill of paddling to a cove in search of wild manta rays, and then watching the beautiful, graceful rays as they feed and flip through the water. While watching the rays from the kayak is great, it’s even better when you grab a snorkel and slink off the edge of your boat — joining the wild rays for a swim and an unforgettable snorkel.